This simple sponge is enhanced with orange and lemon zest. 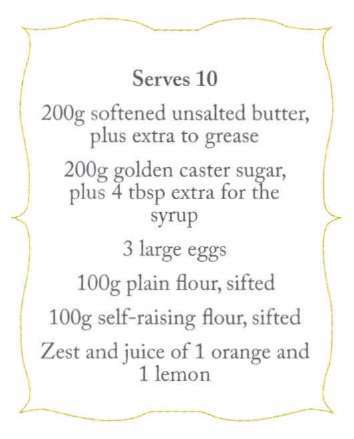 It becomes beautifully moist when you pour over the orange and lemon syrup while the cake is still warm. Preheat the oven to 170°C/325°F. Grease and line a 900g. loaf tin with greaseproof paper. Beat together the butter and 200g. sugar in a large bowl using an electric hand whisk. 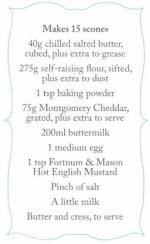 Gradually add the eggs, adding a spoonful of flour if the mixture looks like it is about to curdle. 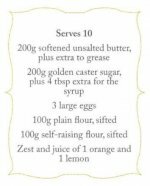 Fold in the remaining plain flour, all the self-raising flour, the orange and lemon zest and half the juice. Spoon into the prepared tin and bake for 1 hour until a skewer inserted into the centre comes out clean. Remove the cake from the tin and cool on a wire rack. Put the remaining orange and lemon juice in a pan with the four tablespoons of sugar. Heat gently to dissolve the sugar. Drizzle over the cake and leave to soak in. Serve sliced or store in an airtight container for up to 5 days.